Intuitively designed, non-cluttered field menus resulting in reduced errors and minimized training time! 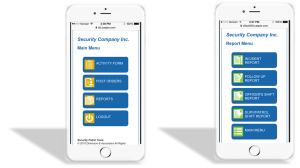 was designed by security industry professionals who know exactly what security company Owners/CEO’s require to manage their field activity. We are also well aware of the burden extensive training hours put on operation’s management. That is why training for our system is measured in minutes, not hours!